Daring to take a sermon outside and ask, "SO WHAT?" Summer Worship: Don’t miss the possibility! June 3,2018. 1 Samuel 3:1-20 “Equip for youth” The Skill of listening The life of faith is the key to a young soul. Our bodies age but we can keep a youthful and excited spirit by being equipped for and equipping others for healthy eternal living in the here and now! What does equipping mean anyway ? June 10, 2018. Mark. 3:20–35 “Forgiveness is standard equipment”. The Skill of ForgivenessWe are born to forgive and lose this skill along the way somehow. When we forgive we are freed, even if others think we are crazy for doing so. How do you forgive that one who doesn’t deserve it? June 17, 2018. 2 Corinthians 5:6-17. “I See…”.The Skill of DiscernmentDad’s only know where to go when they walk by faith. Many don’t and bear the bitter fruit of walking alone. This applies to all disciples. Discernment is a skill learned through prayer and applied in every day ways. The voice of the Spirit is often dismissed. How do you listen for God’s direction. Prayer is an essential skill. June 24, 2018 Mark 4:35-41. “Life-Speak” The Skill of Planning for AdversityAdversity is real and essential to our witness. How do we speak of our “storms” as victory and not failure. Holding a spiritual conversation in our own words is an essential skill. How do we speak life? July 1, 2018 Acts 20:8-17 “Pay Attention” The skill of Sacramental LivingThe sacraments are a gift to the church and a pattern for living for each disciple. How can your life be a means of grace EVERYDAY? July 8, 2018 Mark 6:1-13 “ A Mutual Education” The skill of TeachingNo one out learns a true teacher. The gift of teaching is not upon everyone BUT the ability to teach is a skill that can be learned. We all teach others the things we know. How will we share the gospel honestly and personally. July 15, 2018 Guest Pastor: Rev. Mike Toland! 2 Samuel 6:1-13 “Real Might” Worship. The skill of communicationWorship is directed to the one true God but interpreted differently by different people. True might in worship is that connection between hand and heart that comes when we let down our guard and celebrate the Holy Spirit. Cheatham Memorial’s Sermon series for Advent is “Christmas is a family Story” with first Sunday of Advent being the Sunday of Hope. Our message for Sunday, November 27, 2016 came from Matthew 1:18-25 and was titled “A Family of Hope”. Please read this before you finish this post. The Blble’s focus is on the Holy Family and lifts them up as an example of how our families need faith to be healthy and thriving. Mary and Joseph are struggling here but HOPE KEPT THEM GOING. If your family, whatever it looks like, is struggling, there is hope for you in Christ. The beautiful young ladies are our hope and remind us what hope looks like. They beam with the life of Grace. We owe them the gift of Hope that Jesus brings to our family and share the story. The Bible’s word for hope is elpis (el-pees) and is defined as a trust, confidence, expectation and anticipation of welcome and security. It is the sweet sister of the word faith and is the fruit of good character which is founded on faith in Christ. Hope is how faith carries on when times get tough. We can do anything as long as we don’t lose hope. Hope as a family value is multiplied as our family grow in both number and spiritual maturity. One carrying a grandson due in January, one with twins in April and one Son-in-Law absent- that is 15! Teresa and I married. That makes a family of two. We have three married children, two grand’s and three more grand children on the way. Our family is now 15 which means our influence has gone up over seven fold. Hope is more than a numerical change though, also we have all grown in faith. Our family is not perfect. We have all had times of darkness and doubt but draw on the foundation of Jesus Christ and His living hope that we will outlast our troubles. Our relationship with Jesus is eternal, our trials are temporary, and our life of salvation is always growing stronger. THE FAMILY IS THE PLACE WHERE THE SEEDS OF HOPE ARE PLANTED AND NURTURED AND TOLD IN OUR FAMILY STORY. Matthew chapter 1 begins Jesus’ genealogy and lists the super heroes of faith. If Fred the donkey thief was in there somewhere but somehow became forgotten. The family story of hope has a healing amnesia that conquers the darkness. It shows up in Jesus family just as it does in ours. There are two lessons here. One, that the Holy family is called of God and two-family MATTERS! Joseph was not superman, he was a working guy-a carpenter- and he knew without a doubt that Jesus wasn’t his child. He also knew the living God and was a spiritually sensitive soul. When the angel of God spoke he obeyed, knowing the cost to his reputation, his family relationships, knowing he was losing his home town, and his business. Joseph chose to cling to the hope of the future and the direction of God rather than divorce. Mary knew her lord, knew without a doubt that God is the source of hope for her family, that hope wouldn’t come from the neighbors, She and her husband would cling to their faith and live the promise growing within her body. This family is not so different from yours and mine. They could have doubted and split. Instead they clung to God’s hand and their unique calling as a family and overcame. First, The center of everything in this text is HOPE from Christ. That hope is caught by faith, taught in the hard lessons of life, and transmitted to the next generation. The Christian life is real life and God meets you where you are. If any member of the family grows in faith, the whole family grows in faith. If you aren’t a Christian or are but don’t go to church, would you be willing to try worship during the Christmas season? What would encourage you to go? What is God calling your family to do? How do you plant or communicate hope during a hard time to your family? How are you growing personally as a disciple of Jesus Christ? How do you pray for your family members? What story does the “Bible” of your life tell?? Cheatham Memorial’s Theme for Advent2016 is, “Christmas is a Family Story”. The title has two meanings. First, the Holy Family of Mary, Joseph and Jesus is central to the Gospel. However, and second, so is OUR family story, and OUR family traditions. SO….with the telling of the Gospel at Advent and Christmas, interacting with our deep sense of family tradition s, a rich potential for spiritual growth is born at Christmas. Your family may look like a Norman Rockwell Christmas card or it may look like quite the opposite. God is not impressed with mere appearances either way. The Christ came at Christmas for all families in their many forms. You don’t have to meet some ideal to be moved by the love of Christ as shown in HIS family. The Bible tells us that on the first Christmas, Jesus family was a day labor carpenter named Joseph, travelling with his pregnant fiancé Mary, to pay taxes they couldn’t afford without the money to for transportation and a proper hotel room. Jesus came as a surprise that night. There was desperation and poverty in Jesus’ family all over this story including His dad disappearing from the family without explanation. The thing that held this family together was a strong relationship with the living God and a deep connection to their extended family and church family. The only reason that they didn’t divorce was that God reached out to Mary and Joseph to assured them both that they were ok even if the rest of world didn’t understand. AND THEY LISTENED TO GOD. What does your family story need from the Gospel of Jesus’ family this Christmas Season? We welcome you to join our family in East Texas or to follow along on our website. The five sermons from November 27 through Christmas day will be outlined here at thethoughtfulpastor.com and you are welcome to give a comment or ask a question. A list of our Christmas projects and worship can be found at our main website. Plug in to any of our activities and add us to your family traditions. We are an easy church to “break in to”. You may contact me through the site or email me at revavanhooser@aol.com. God’s richest blessings to you as we prepare together for the coming of Jesus at Christmas! Click here to read This week’s text for this sermon bite. This past Saturday I was rewarded with an honor that shows that my vast array of gifts and graces are finally being recognized Members of our Historical Society, who care for our magnificent Edgewood Heritage Park ( it is a living museum! ), sought carefully and bestowed upon me the august honor, I sniff back a tear just thinking about it, of making me a Judge, yes a ju dge…..of the pinto bean competition. While I am only a talented amateur at this time, with the proper training, focus and motivation I might go professional in the future. Sadly, the title would not fit onto my business cards but I will prevail as people recognize this honor and see me in the light of a true pinto bean judging professional. And when the pronounce, out of jealousy, that I am full of beans, I will proudly proclaim my gracious thanks for recognizing this wonderful filling within me. Hallelujah and amen. Look at the title; The Capital “C” Church is the worldwide saving enterprise of which our small “c” church-congregation is a part. and while it meets at the Church-House or sanctuary, of which we are blessed to have a great facility, the building is NOT the church. Those smiling people at the top of the post are the real sure enough, Jesus following, Spirit led CHURCH. Admittedly the Jerusalem Temple was a big deal. Originally built in 957 BC, Destroyed around 604 BD, Rebuilt a century later and then remodeled just before the time of Christ’s earthly ministry, it was a huge facility that was more than a church. This was an icon of the Jew’s national, racial and religious identity. To the Jew, the Temple was a sign that God’s victory over the world and was a center of the world and not just the center of Israel. The Temple is where God lives and provided a place to speak to and about God! This was where people were led to God and learned the stories that edified faith. However, it had sadly become and idol to some and an amusement park to others rather than a power center of God. The Roman invaders used it as a tool of manipulation. By controlling Temple worship and giving local leaders municipal “Bean Judge” type titles, a small force would control big crowds through brutality and civic organization. This past Friday, this old pattern would come to call in the attacks in France: At this writing there are 129 dead with 352 others wounded, 99 of them critically in premeditated and coordinated attacks — This isn’t merely terror, it is war. This is also not faith but a false and narrow chaos dressed up as religion. In light of the horrific attacks in Paris, terrorist tactics haven’t really changed that much since the first Century. Neither has the Gospel. We can watch terror groups who wage this war on us as they prey on populations who are desperate , and will grab onto anyone that gives hope. Beyond the extortion and brutality, modern terror groups are fixing basic needs, Providing an identification and a purpose “organizing social welfare programs and even recreational activities for children, distributing food and fuel to the needy, and setting up clinics.”* This helps build community around the groups ideals. They build on earth for war while we build for the Savior and His Kingdom. Last Friday, the command to love our enemy became far more difficult and Romans 12 says “17 Do not repay anyone evil for evil. Be careful to do what is right in the eyes of everyone. 18 If it is possible, as far as it depends on you, live at peace with everyone. 19 Do not take revenge, my dear friends, but leave room for God’s wrath, for it is written: “It is mine to avenge; I will repay,”[says the Lord.“ The voices who spout wrath can be attractive. But wait a minute and consider a truly Christian response to this terror. First, DON’T FORGET GOD, we must respond by a smart faith. Rage isn’t enough. Warmongering at all cost in the Name of God on our own will is the height of spiritless and human centered Sin. On the other hand Peace Mongering at all cost in the name of Jesus is lazy and far less Christian. We cannot lose our souls by replacing our faith in the risen Jesus with faith in government and weapon systems. Seek Christ by holding fast to Christian Standards and principals and recognize in this text, that this isn’t God’s first experience with this behavior. We must pray, search the scriptures and engage our enemy like never before and do it AS THE CHURCH. Second, find ways to cope NOW: take care of our kids and other sensitive people by limiting the terrible images. Stay informed but don’t add to the sensationalism of the Media. Stay connected with God in prayer, study, service and worship. Keep it real and not just routine to keep the fear in perspective. Be prepared to grow spiritually and be challenged in this “Desert Spirituality” in its great cloud of unknowing- “Wars and rumors of wars”. Prepare for the future with and for the living God. We must fight by faith and remember that we do not fight alone. Again, this is not easy but by God’s grace it is possible. This isn’t about beans! With the proper training, focus and motivation we will be able to judge a secure truth through the eyes of Christ. This post is a follow-up to our sermon from last Sunday and I pray it touches your heart and that you have a church to be “Welcome Home”. If you don’t, please click on the link below and check out our Family. We would love to welcome you whenever you find yourself in our corner of East Texas. Come and see us! So many of us become trapped in the “Shift Work” of life. We work our shift only to begin again and find that spiritual fatigue subtly steals your joy. The life in Christ can give us a moment to get off the hamster wheel and find a new focus through Christian spirituality-not more stuff but more faith! There ain’t no such thing as a free lunch. You have heard this saying your whole life. It is a fact of nature and economy-everything you have has been paid for. Either you worked for it or someone else did, but there is no free lunch. This is the cycle of sin in our lives when we try to free ourselves with our own effort. This saying comes from the New York City taverns in the late 1800’s. If you came in and bought a beverage, lunch was free! Lunch was also salty ham, crackers, pretzels and other salty food which, of course, made the customer thirsty for another beverage. Lunch was not free-it was built in to the sale of the drinks! You ate yourself thirsty again and again! This sales tactic was so effective it was outlawed. The liquid lunch was cutting into commerce and city services! After such a lunch nothing could be done and many employees lost their jobs. This free lunch was very expensive but they paid over and over again. Our salvation covenant is paid for also but instead of a self absorbed and self destructive, Jesus the Christ paid our way at the cross. In Christ we are constructed and not torn down. Salvation is not free but it has not cost we can afford. Jesus paid. That is it. DONE. Yet…. our work as disciples, followers, students of Christ is NOT done. We are redeemed by Christ-literally we have been released from the destructive cycle of the free lunch of sin and its destruction. We are called to discover and grow in our faith. We are called to do things that make us closer to Christ and not do things that obstruct our view of redemption. The writer of Hebrews gives us a view of how this worked in the daily living of those first readers. Take a moment and click here to read the scripture for this Sermon! The worship of those days involved creating copies of heavenly things. The patterns of the priest offering a sacrifice to take away sin had to be done over and over and over. Christ sacrificed himself once and for all! He suffered once and for all. He died and rose once and for all. And finally leaves us with the hope of his reappearing to finish the work he started. No never ending cycle but a relationship with the God of all creation who has paid for our forgiveness once and for all. In Jesus Christ, it is done. We live in a faint copy of the heavenly things but our life in Christ is training for the real thing. The rules described earlier in this chapter are the laws of the desert and not the law of the temple. Christ is the living faith in our every breath and wooing us like those inn-keepers of old. Jesus wants you strong, confident and bold. should be sleeping, self feeding feeling of defeat? This is not the life that Christ died for. You are meant for joy! The antidote is faith and that faith is not a do-it-yourself project. 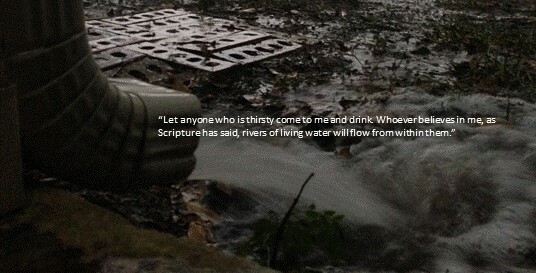 Christ has a rich drink of cold water for you. Jesus is the real deal-A remedy for the real world. HE is the way, truth and the life and not a never ending cycle of following rules and religious actions to achieve a salvation that is already paid for. He breaks the cycle of self-salvation for all who will simply follow HIM. The Jews had been practicing the law for hundreds of generations, had it right, yet exchanged their relationship with doing a law that was impossible to keep. They wandered until they discovered Grace again. Jesus brought this saving, living grace to us all at the cross. This was done and completed in Christ , so that we may serve the living God! Not caught in a cycle of doing things to “get saved”, Jesus has finished that work. But using our faith as a way of growing for ourselves and witnessing as others. Prayer, Disciplined time, disciplined space, and church worship will not save us but it will lead us to that growing awareness of the one who can. These are individual things but the life in Christ is Lived out in community. We at CMUMC NEED OUR CHURCH FAMILY and are working with our vision Statement: “Following, serving and unifying”. However, following alone is self serving, adding the church it become “Iron sharpening Iron” and growth for all. Serving alone is doing good things but when you add this to our church life, it becomes a powerful dual witness, both for the excitement of the church family and the community. unifying alone gives us that single mind of Christ-Focus. But in the church I becomes We and a testament to the power of the Christ covenant to the world. Here is where faith is born and reborn as we search together and “eagerly wait for Christ to be more and more real. Death is a part of live but death has no sting to we who are in Christ. We are born to live for Christ here and eternally hereafter. Christ sacrificed himself once, for all and delivers us to freedom through complete forgiveness. But before that great and glorious day we are created for Growth, Sanctification, and Good Works. Done with this ” unity of the spirit in the bonds of peace”, the life in Christ changes you and in you changes the world. 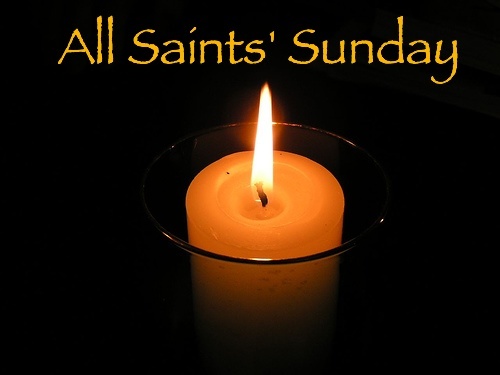 All Saint’s Sunday is that day when we celebrate the lives of those who have passed away in faith. It honors our dead BUT , like all worship, is for the living disciples of Jesus to remember that life matters and death has not victory over us. Our Text is the story of Lazarus from John 11:32-44. However, we have saints among us who have been delivered from the grave. These stories have a lot in common with our text. Each was rescued from the grave by an unseen hand, each experienced a variety of feelings, both in faith and in testing, and all left with a story to tell. Jesus was not stranger to strong emotions. He is seen in the Gospel being furious, frustrated, hungry, and even sad to the point of tears. At the grave of his dear friend JESUS WEPT. In his tears the disciples would see love and not weakness. The crowd would complement Him for them and then curse Him in the same breath. This crowd could not have guessed the power over the grave that Jesus would show them, a demonstration of what would come again at the cross. Lazarus and his sisters were old and dear friends. In this came a tangle of emotions at the grave side. Mary began by faithfully knowing that Jesus COULD have saved her brother. Then, Mary was mad, in faith, and chewed out the creator of the world for His thoughtlessness. Faith subsided, she was surrounded by her church family at the tomb. They stuck with her throughout this four days and when it came down to rolling the stone, she was more worried about the smell that her faith in the Lord. They opened the grave first, then Jesus prayed loud enough for all of the people to hear. He ordered His friend to trade death for life. When Lazarus came out, Jesus simply told those who had the courage to go in with him to takes off the rags of death and this crowd would know that this was no ordinary man. Lazarus was free and yet Lazarus would indeed die and enter into eternal life. This brief reprieve would not cheat Lazarus out of his heavenly home. As Lazarus was freed, so are we. The life in Christ a life sentence and not a death sentence. This was a demonstration of God’s power to the living of today and not just then. All Saint’s Day remembers those who have died, but this time is for us. Confidence in living is ours and fear is crushed by faith. Yet we grieve. Grief is a part of LIFE, you aren’t whipped, It is not weakness, it is not condemnation, it isn’t because you did life wrong and it does not mean that God has given up on you. We grieve BECAUSE LIFE MATTERS. Jesus came to give us life and to have it more abundantly-both here in our time and eternally in our heavenly home! In that abundance, in this time, comes loss. With each loss we are reminded that all that we see is not all that there is to see. With each loss we learn and grow and trust. Sometimes that trust will only come when the unseen hand of Jesus is all that we have. Our losses are not always to death. Yours could be a relationship, job, money, health, or our frustration with life changes. The sisters in our scripture were faithful, certain of Jesus, rich, generous and still have the same grieving as all of the rest. And Jesus was faithful to meet them there. He is faithful to meet us where we are also. In out faithfulness, there is still loss-that is Not defeat it is a human condition. A condition conquered by the sanctifying faith and grace of Jesus Christ. Two things: First, we must be rid of our grave clothes. In Christ you will find victory when life stinks. You will have to work for it sometimes and the journey of faith will often be scary and uncertain but it will not be boring. This is your life-Die like you are living eternally and don’t live like you are dying. Participate in your lives and squeeze all of the good stuff out. Then share your story. So second, we don’t live only for ourselves. Take another look verse 44: “Jesus said to “them“, “Take off the grave clothes and let him go.””. Them, brothers and sisters, is us. We are the everyday saints, not perfect but redeemed, we are God called to share true living with those bound in a mummy’s rags. our story of faith matters. This is what ministry is, Many activities, done in many ways, using our many talents, at various times, to build us up, and ultimately to point to the resurrected Christ to others. This service remembered our dead, but it is ministry to you, me, and we as the church as we celebrate and share the gift of the abundant life in Christ. This post is a follow-up to our sermon from Sunday and I pray it touches your heart and that you have a church to be “Welcome Home”. If you don’t, please click on the link below and check out our Family. We would love to welcome you whenever you find yourself in our corner of East Texas. Come and see us! This is the final offering in a series of sermons with the goal of clearing the clutter that we tend to pile around the Bible. Join with us as we explore these stories together. This week we are invited to match up what God puts in our heart and what we say with our tongues. On a Sunday afternoon in Freestone County Texas drought had plagued the land, humidity was about 15% and the wind was blowing about 30 miles per hour and there was not a chance of rain. In the mid afternoon in an area called “Cotton Gin” a pasture caught fire and started a wild fire that burned for almost two weeks, destroying homes, outbuildings, woods and pasture. the question would be asked many times, How did it start. The story was that it began when a squirrel got tangled up in a transformer and our corner of the world changed forever. It is a good story whether true or not. The conditions were perfect and only by the efforts of scores of firefighters from a dozen fire departments was the fire contained and eventually put out. Looking around at our church we are experiencing the perfect conditions for a fire of another sort, that of God’s revival fire. People are looking for answers in a culture that has none. The church of Jesus Christ is still alive and relevant though not in fashion for the moment. The fire of the Gospel is poised to catch and brings the fruit of joy and peace and takes away anxiety and death. Only by the efforts of God’s faithful will THIS FIRE, one so desperately needed be contained and extinguished. God is going to win. Will God do so because of us or in spite of us. The key to stoking this positive fire of revival, one that takes away devastation, is what my mom told me too many times, “Watch your mouth!” This is central to James’ message to us in our scripture text today. Remember! There first person the preacher has to preach to is the Preacher. I am not on any pedestal here. We all stumble, we all shouldn’t teach but we must all LEARN! Disciples are students and can learn to control our tongues. The call of God is spiritual maturity. Maturity is best understood as growing in the Christ centered single mindedness of “Loving nothing but God and hating nothing but sin”. Maturity is best seen when what we speak reflects how we are in Christ, maturity in this sense is being and saying exactly what God has called us to be. This involves focusing the tongue more than “taming”. James tells us that no one can tame the tongue but we can grow and focus our words on the things of God. We keep our words from burning a life down and use them to inspire spiritual greatness. These words are the seed of Revival fire, one that we don’t want to quenche. Only God can start it, and only We can prevent it. We can tame the tongue but we must. HOW?? Hit The Pause Button. This is not merely biting your tongue or biding your time, or just cooling off. But, Inviting the Grace of Jesus Christ to be more important than your words. Your saying should be a reflection of your saving. Prayer prevents foot in mouth disease! Our witness is more fragile, more today than ever before. We simply must find our relationship with Christ and be a blessing and not a cursing. Our words show others what Christ looks like. Thus, you and I need to know our mission and know what that mission looks like in both our personal lives and in the lives of our congregations. I f I know my mission, I can speak clearly of what I do. This is the mission of the United Methodist Church. While written to congregations, it is a solid and scriptural description of who I personally am in Christ too. Even in my congregation, my walk with Christ is person and I cannot be a transforming presence if I have not experienced it myself. 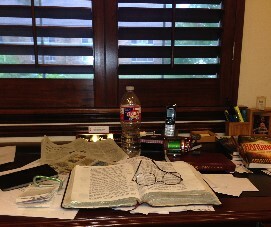 All of this is to God’s glory and not mine! This is our vision of what that looks like in our congregation. Welcoming, Loving with Action shown through following Jesus, Serving our community and unifying the body of Christ is what being a disciple looks like. Saying what we mean and doing what we say is controlling our tongues. We cannot tame the tongue but we can focus it. We cannot remove all of our deadly poison but we can grow in grace. Remember when we try our hardest- One squirrel can get tangled in our lives and turn our best efforts into a deadly wildfire! Talk is cheap as “faith without works is dead”. Be alive in Christ. How will you and I we inspire the fires of revival. It starts with our personal discipleship-accepting Christ as our savior. We are formed as true disciples by Following Christ, Serving our mission field and unifying as the body of Christ. These are the seeds of spiritual grown, thes are the seeds of revival. This post is a follow-up to our sermon from Sunday and I pray it touches your heart and that you have a church that makes you feel “Welcome Home”. If you don’t, please click on the link below and check out our Family. We would love to welcome you whenever you find yourself in our corner of East Texas. Come and see us!